Asceticism often has a bad reputation in vitalist circles. The idea of the sexless, passionless, passive, world-rejecting monk seems self-evidently maladaptive, an evolutionary dead end, as Nietzsche and Savitri Devi surmised. Yet the fact is that monks have often been warriors, and the monarchs of ascetic religions, such as Christianity and Buddhism, have often been great conquerors. The Christian monastic orders contributed greatly to the fight against Muslim aggression in the Middle Ages and proved capable of exterminating the last pagan holdouts in the Baltic region. In Japan, Zen Buddhism was the religion of the samurai, who developed a warrior ethos, Bushidō, which was one of the most profound and spiritual of its type in the entire world. Whereas Buddhism today is often associated with a kind of rootless, feel-good pacifism, in the first half of the twentieth century, the Zen schools of Imperial Japan enthusiastically supported national military power and selfless service to the Emperor as the divine embodiment of their nation. Zen monks and leaders developed a so-called “soldier-Zen” (gunjin-Zen) and strongly supported Japan during the Second World War, both in its imperial ambitions and in its resistance to the Allies. In the post-war years, many liberal Western converts to Zen were shocked to discover that their “enlightened” masters had supported authoritarian militarism and imperialism. Personally, I have long thought that Zen spiritual practice could lead either to world-rejecting withdrawal or to detached, possibly violent, self-sacrifice of the kind evocatively described in the Hindus’ Bhagavad Gita. 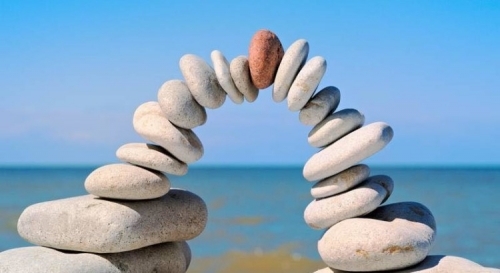 The Zen practitioner trains himself to tolerate discomfort, self-discipline, self-awareness, and ultimately a kind of transcendence of the self as illusory. One realizes, intimately, that one is nothing but a part of a boundlessly greater whole and a web of interdependent relationships. At the same time, there is a grim quality to Buddhism in general: Gautama’s insight was in recognizing the transience of all things: not merely of nations and empires and of one’s life and possessions, but even of one’s mind, even of the gods (on which the Nordic Eddur agree, for they foresee the inevitable Twilight of the Gods), perhaps even of the universe itself. In Zen in particular, all is “vacuity,” and one learns to stare into the void with serenity, without flinching, even cultivating a quiet, transcendent joy. However, not all are so strong. The “abyssal realization” can easily lead one to fall into despondent discouragement or withdrawn nihilism. There is little emphasis in Zen on building something that might outlive us, on the cultivation of Life. However, Victoria recognizes that early on in the Mahayana tradition,  violence could be religiously sanctioned, which he claims were monastic rationalizations in the service of pro-Buddhist monarchs, and that such violence has been a recurring feature in Buddhist history. The first-century Nirvana Sutra had commanded “protecting the true Dharma [Buddha’s teaching] by grasping swords and other weapons.” In passing, it appears that the ancient Greek converts to Buddhism of Gandhara had, as monks and kings, a certain role in shaping and spreading Mahayana. The samurai appear to have had little difficulty in reconciling their Zen religion with their warrior ethos. 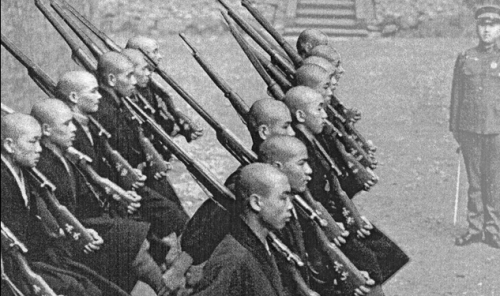 In the twentieth century, the Imperial Japanese developed soldier-Zen as a particular spiritual ethos compatible with their nation and state. 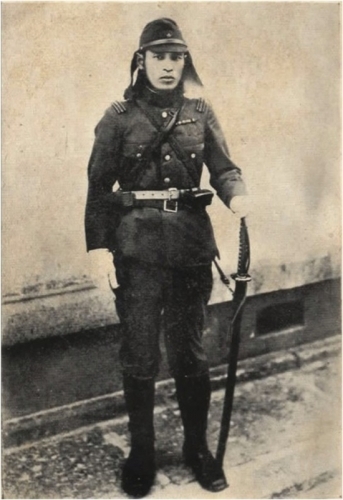 This was advocated in particular by Lieutenant Colonel Sugimoto Gorō (1900-1937), who died in battle in China, and was honored by the Zen orders as a “military god” (gunshin). The Zen that I do . . . is soldier-Zen. The reason that Zen is important for soldiers is that all Japanese, especially soldiers, must live in the spirit of the unity of sovereign and subjects, eliminating their ego and getting rid of their self. It is exactly the awakening to the nothingness of Zen that is the fundamental spirit of the unity of sovereign and subjects. Through my practice of Zen I am able to get rid of my ego. In facilitating the accomplishment of this, Zen becomes, as it is, the true spirit of the Imperial military. The emperor is identical with the Great [Sun] Goddess Amaterasu. He is the supreme and only God of the universe, the supreme sovereign of the universe. All of the many components [of a country] including such things as its laws and constitution, its religion, ethics, learning, art, etc. are expedient means by which to promote unity with the emperor. That is to say, the greatest mission of these components is to promote an awareness of the non-existence of the self and the absolute nature of the emperor. Because of the nonexistence of the self everything in the universe is a manifestation of the emperor . . . including even the insect chirping in the hedge, or the gentle spring breeze. . . . If you wish to penetrate the true meaning of “Great Duty,” the first thing you should do is to embrace the teachings of Zen and discard self-attachment. War is moral training for not only the individual but for the entire world. It consists of the extinction of self-seeking and the destruction of self-preservation. It is only those without self-attachment who are able to revere the emperor absolutely. Life and death are identical. [Compare the Zen concept: “Unity of life and death” (shōji ichinyo)] . . . Warriors who sacrifice their lives for the emperor will not die, but live forever. Truly, they should be called gods and Buddhas for whom there is no life or death. . . . Where there is absolute loyalty there is no life or death. 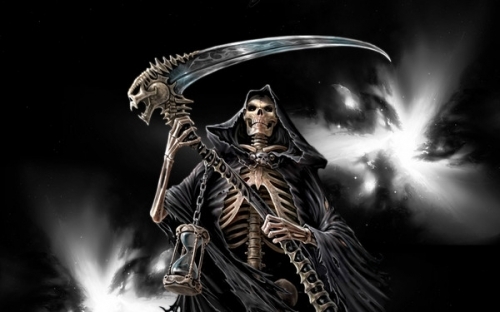 Where there is life and death there is no absolute loyalty. When a person talks of his view of life and death, that person has not yet become pure in heart. He has not yet abandoned body and mind. In pure loyalty there is no life or death. Simply live in pure loyalty! In Buddhism, especially the Zen sect, there is repeated reference to the identity of body and mind. In order to realize this identity of the two it is necessary to undergo training with all one’s might and regardless of the sacrifice. Furthermore, the essence of the unity of body and mind is to be found in egolessness. Japan is a country where the Sovereign and the people are identical. When Imperial subjects meld themselves into one with the August Mind [of the emperor], their original countenance shines forth. The essence of the unity of the sovereign and the people is egolessness. There is an almost “national-pagan” quality to soldier-Zen’s sublimation of the self into an assertive nation mystically united around a divine monarch. A grenade fragment hit him in the left shoulder. He seemed to have fallen down but then got up again. Although he was standing, one could not hear his commands. He was no longer able to issue commands with that husky voice of his. . . . Yet he was still standing, holding his sword in one hand as a prop. Both legs were slightly bent, and he was facing in an easterly direction [toward the imperial palace]. It appeared that he had saluted though his hand was now lowered to about the level of his mouth. The blood flowing from his mouth covered his watch. In the past it was considered to be the true appearance of a Zen priest to pass away while doing zazen [seated meditation]. Those who were completely and thoroughly enlightened, however, . . . could die calmly in a standing position. . . . The reason this was possible was due to samādhi [concentration] power. To the last second Sugimoto was a man whose speech and actions were at one with each other. This sentiment is perfectly in accord with ancient Western philosophy’s attitude towards death, from Socrates to Marcus Aurelius. I cannot say whether Mahatma Gandhi was right in claiming that all forms of violence are immoral. However, I observe that, in any case, the vast majority of mankind does not abjure violence. 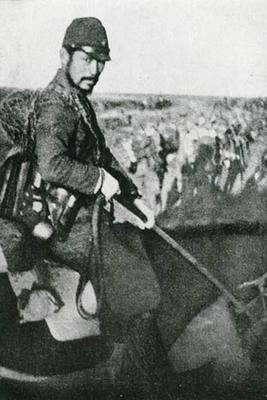 For most, then, the martial self-sacrifice of soldier-Zen cannot be bad in itself, but merely depends on the morality of the cause which it serves. Nor can I say whether Friedrich Nietzsche was right in claiming that the ascetic ideal is inherently emasculating and one needs a more primal, spontaneous, Dionysian way of life. However, we would have to admit that ascetic practices appear to have been central to the martial prowess of fighters as diverse as the ancient Spartans, the medieval Christian warrior-monks, and the Imperial Japanese. No doubt, different individuals will flourish and better actualize their potential in following a more ascetic or more “barbaric” ethos, depending on their temperament. After the Second World War, the Americans demanded that the Japanese Emperor renounce his claims of godhood. This may have been understandable from a rationalist and materialist liberal perspective, which saw these claims as not only self-evidently false and even deceitful, but also as having provided part of the foundation for Japanese militarism and international aggression. But there was also a price to be paid: the disenchantment of Japan, the reduction of that nation from a mystical family with a special destiny to a mere population of consumers. Human life, no doubt, suffers and becomes impoverished from a lack of a sense of higher purpose. I will not bore you by citing the various psychological studies suggesting this. Each one who, with but a little sensitivity, looks into his own heart will know it to be true. I do not accept that nothing exists besides this transient world and that, therefore, nothing in a sense ultimately exists. Even when the Himalayas are ground to dust, humanity goes extinct, and this universe itself is torn asunder, some things, I can sense, will always remain and are eternal: the principles of reason and the yearning-for-life. Individual human life, in all its arbitrariness and brevity, seems to have meaning only if that existence can truly be recognized and lived as part of a greater whole. That was evidently one of the ambitions of soldier-Zen. Brian Zaizen Victoria, “A Buddhological Critique of ‘Soldier-Zen’ in Wartime Japan,” in Michael Jerryson & Mark Juergensmeyer (eds. ), Buddhist Warfare (Oxford: Oxford University Press, 2010), pp. 105-30. Mahayana, or the “Great Vehicle,” refers to the great branch of Buddhism largely coterminous with the East Asian nations. It is often contrasted with Theravada Buddhism, which is often criticized by Mahayana Buddhists as aiming for a “nirvana” which means non-existence or oblivion. Le concept de communauté internationale, qui revient de façon récurrente dans le discours des diplomates occidentaux, n’est qu’un artifice destiné à légitimer la politique étrangère des États-Unis. Or celle-ci, porteuse de l’idéologie mondialiste, est contraire aux intérêts de la France et de l’Europe. Aussi notre pays devrait-il, selon Ligne droite, contester l’organisation actuelle des relations internationales et nourrir la grande ambition d’œuvrer à l’avènement d’un « nouvel équilibre planétaire » ancré dans la réalité du monde multipolaire d’aujourd’hui et axé sur la régulation des échanges. La notion de « communauté internationale », qui reprend sous un angle un peu différent celui de nouvel ordre mondial très en vogue à la fin du XXe siècle, est en effet une formule des plus ambiguë. Ceux qui s’en réclament laissent entendre qu’ils parlent pour l’ensemble des nations du monde, alors qu’il ne s’agit le plus souvent que des États-Unis et de leurs « alliés ». Cette référence à la communauté internationale est dès lors quasi systématiquement utilisée pour des actions ou des prises de position qui servent les États-Unis et leur vue du monde. Autant dire, dans ces conditions, que cette notion s’inscrit dans un cadre très politiquement correct. Elle repose sur l’idée que le modèle américain fondé sur le libéralisme et la démocratie va s’étendre au monde entier et s’appuie sur l’idéologie mondialiste qui conduit à supprimer les frontières, à réduire le pouvoir des États et à œuvrer à la globalisation de la planète. En effet, la communauté internationale en question ne se préoccupe pas des identités et considère avec méfiance les États qui y demeurent attachés comme la Russie et tous les pays de l’Est de l’Europe. Ligne droite estime en conséquence que les notions de nouvel ordre mondial et de communauté internationale doivent être rejetées car elles véhiculent le mondialisme, le libre-échangisme intégral, l’immigrationnisme et l’atlantisme. À ce titre, elles vont à l’encontre de ce qui est souhaitable pour le France et l’Europe, aussi notre pays doit-il les contester tout en proposant une autre vision. Cette démarche se révèle d’autant plus légitime que le concept de communauté internationale ne correspond en rien à la réalité du monde d’aujourd’hui. La planète est en effet loin de converger autour du pôle américain, lequel perd d’ailleurs de son influence. Notre époque apparaît au contraire marquée par l’émergence de nouvelles puissances qui structurent la scène mondiale selon un schéma multipolaire. Un schéma qui n’est pas compatible avec la notion de communauté internationale puisqu’aucun des nouveaux pôles émergents comme la Chine, l’Inde ou le monde musulman, pas plus d’ailleurs que la Russie, le Brésil ou l’Afrique, ne sont prêts à s’aligner sur les États-Unis. Ligne droite considère donc que la France devrait se faire le champion d’une autre conception des relations internationales. Une conception qu’elle devrait populariser sous le nom de « nouvel équilibre planétaire » et qui devrait reposer sur deux grands principes : prendre en compte la réalité multipolaire du monde d’aujourd’hui et substituer à l’ultralibéralisme international le principe de la régulation générale de tous les échanges. Contrairement au nouvel ordre mondial qui organisait le laisser-faire laissez-passer général tant pour les biens et services que pour les mouvements migratoires, le nouvel équilibre planétaire proposé par la droite nouvelle devrait s’appuyer sur le principe simple selon lequel les échanges ne sont admis que s’ils sont bénéfiques pour les deux parties concernées et doivent donc être régulés en conséquence. Dans ce cadre, l’organisation du commerce mondial devrait être entièrement revue et de nouvelles négociations devraient être ouvertes en son sein pour mettre en place des écluses douanières entre les grands ensembles économiquement homogènes. De même, s’agissant de l’immigration, la maîtrise des flux devrait s’imposer comme la règle commune. Aucun mouvement migratoire ne pourrait être organisé sans l’accord des deux pays concernés. Quant aux déplacements clandestins, ils devraient être combattus par les pays d’émigration comme par ceux d’immigration et, dans la mesure où ils sont organisés par des filières mafieuses, traités comme tels par les services compétents. Par ailleurs, le nouvel équilibre planétaire devrait prendre en compte la réalité du monde et reconnaître son caractère multipolaire. Pourrait en effet être constitué un G9 d’un nouveau genre regroupant les principaux pôles de puissance: Chine, Japon, Inde, Brésil, États-Unis, Russie et Europe, auxquels devraient être adjoints deux autres États, l’un représentant le monde musulman et l’autre l’Afrique(au besoin selon une formule de tourniquet). Une telle instance même informelle qui représenterait avec neuf partenaires la presque totalité de la population mondiale pourrait être le lieu le plus pertinent où débattre des conflits et des problèmes du monde. Une configuration qui serait capable d’apporter une plus grande stabilité internationale, car fondée, non plus sur une puissance unique qui cherche à s’imposer, mais sur l’équilibre des principaux pôles de puissance de la planète. Pour mettre en œuvre un tel projet, très différent des pratiques actuelles, la droite nouvelle, une fois au pouvoir, devrait commencer par faire de la France le champion de cette idée, à charge pour elle de l’expliquer et d’en assurer la promotion. Si, ensuite, l’Europe confédérale, telle que préconisée par Ligne droite, reprenait ce projet à son compte, gageons que tout deviendrait alors possible. L’idée d’un nouvel équilibre planétaire pourrait en effet intéresser les BRICS. Le Brésil, la Russie, la Chine, l’Inde et l’Afrique du Sud cherchent en effet à réduire l’influence des États-Unis dans le monde. Ils ne pourraient dès lors que soutenir un projet visant à institutionnaliser la réalité multipolaire qu’ils incarnent et, forte de ce soutien, l’Europe serait en mesure de faire prévaloir ce changement radical de l’organisation des relations internationales. En tout état de cause, la France, dirigée par la droite nouvelle, aurait tout intérêt à porter l’idée d’une rénovation profonde des relations internationales. En dehors des bénéfices qu’elle et les autres pays européens pourraient en retirer si le projet se concrétisait, le seul fait de s’en faire l’artisan permettrait à la France de gagner en stature et d’offrir aux Français des perspectives ainsi qu’une ambition collective qui leur rendrait espoir et fierté. Nous avons mentionné plusieurs fois ici le fait que l'Europe, dont la population autochtone de quelques 500 millions de personnes n'augmente pas et vieillit, sera submergée d'ici la fin du siècle, sinon bien avant, par une immigration venue d'Afrique. Ceci sera inexorable, pour plusieurs raisons. * Les mouvements démographiques ne se contrôlent pas et à supposer qu'ils le soient, ne se modifient qu'après plusieurs décennies. Or la population de l'Afrique sub-saharienne compte environ 2 milliards d'habitants. Du fait d'un taux de croissance tenant au fait que les femmes en âge de procréer auront encore au moins 6 enfants pendant plusieurs décennies, cet effectif devait atteindre 4 milliards d'ici la fin du siècle. A supposer que des politiques strictes de contrôle des naissances soient mises en place, elles n'auront pas d'effet durant cette période. Mais, pour des raisons religieuses ou par simple persistance des pratiques actuelles, de telles politiques, à supposer qu'elles soient décidées, ne seront pas appliquées. * De plus en plus de migrants africains se seront convertis à un islam radical dans les prochaines années, islam pour qui la conquête de l'Europe chrétienne ou athée a constitué un impératif religieux dès les origines de l'Empire Ottoman. *Il en résulte que ce que les Européens appellent encore la civilisation européenne disparaitra dans les prochaines décennies. Ce sont des choses courantes, se consoleront les anthropologues, par ce qu'au fil des temps, les civilisations se sont succédées sans mettre en péril L'expansion de l'espèce humaine. Le 17 mars 2018, Alain Finkelkraut dans l'émission Répliques, a donné la parole à deux auteurs dont les ouvrages, en termes différents, abordent ce problème – sans apporter évidemment de solutions crédibles. Nous en redonnons ici les références. Serge Michaïlof, chercheur à l'Iris, a été l'un des directeurs de la Banque mondiale et le directeur des opérations de l'Agence française de développement. Il a publié en 2015 chez Fayard Africanistan : l'Afrique en crise va-t-elle se retrouver dans nos banlieues ? L'Europe vieillit et se dépeuple. L'Afrique déborde de jeunes et de vie. Une migration de masse va se produire. Son ampleur et ses conditions constituent l'un des plus grands défis du XXIe siècle. L'Union européenne compte aujourd'hui 510 millions d'habitants vieillissants ; l'Afrique 1,25 milliard, dont quarante pour cent ont moins de quinze ans. En 2050, 450 millions d'Européens feront face à 2,5 milliards d'Africains. D'ici à 2100, trois personnes sur quatre venant au monde naîtront au sud du Sahara. Stephen Smith est américain et a été journaliste spécialisé sur l'Afrique pour Libération et Le Monde de 1986 à 2005. Actuellement il enseigne les études africaines à l'université de Duke (USA) Il vient de publier chez Grasset La ruée vers l'Europe : la jeune Afrique en route vers le vieux continent. L'Afrique « émerge ». En sortant de la pauvreté absolue, elle se met en marche. Dans un premier temps, le développement déracine : il donne à un plus grand nombre les moyens de partir. Si les Africains suivent l'exemple d'autres parties du monde en développement, l'Europe comptera dans trente ans entre 150 et 200 millions d'Afro-Européens, contre 9 millions à l'heure actuelle. Une pression migratoire de cette ampleur va soumettre l'Europe à une épreuve sans précédent, au risque de consommer la déchirure entre ses élites cosmopolites et ses populistes nativistes. L'État-providence sans frontières est une illusion ruineuse. Vouloir faire de la Méditerranée la douve d'une « forteresse Europe » en érigeant autour du continent de l'opulence et de la sécurité sociale des remparts - des grillages, un mur d'argent, une rançon versée aux États policiers en première ligne pour endiguer le flot - corrompt les valeurs européennes. L'égoïsme nationaliste et l'angélisme humaniste sont unaniment dangereux. Guidé par la rationalité des faits, cet essai de géographie humaine assume la nécessité d'arbitrer entre intérêts et idéaux. En quelques heures, Donald Trump a remplacé le secrétaire d'Etat Rex Tillerson, venu de l'industrie pétrolière, par Mike Pompeo, directeur de la CIA. A la tête de cette agence, il a nommé Gina Haspel, précédemment seconde de la CIA, et connue par son passé belliciste radical. Experte en interrogatoires musclés, elle a été surnommée la "grand-mère tortures"
Cela signifie-t-il que Trump cherche à s'affranchir de la tutelle de ses quatre généraux pour se mettre sous la tutelle de la CIA? Ces généraux ou anciens généraux sont John Kelly, James Mattis, H.R. McMaster et Michael T. Flynn sans compte un Keith Kellogg moins connu. La présence de ces généraux avait pu inquiéter. On y voyait le Pentagone au commande d'un Président, Donald Trump, fluctuant entre la guerre et la négociation avec la Chine et la Russie. Néanmoins, ces dernières semaines, alors que Trump menaçait de réduire en cendres la Corée du Nord et d'attaquer la Chine en Mer de Chine, il avait paru que ces généraux avaient calmé Trump en lui montrant l'impossibilité de gagner de telles guerres sans provoquer un conflit nucléaire mondial. Sans que ces généraux perdent totalement leur influence sur la Maison Blanche, leur rôle de pilotage sera nécessairement affaibli au profit de la CIA. L'on ne sait pas encore ce que seront les décisions de Mike Pompeo au plan de la stratégie internationale, et notamment en ce qui concerne la politique à l'égard d'un Vladimir Poutine plus fort que jamais aujourd'hui du fait de la révélation qu'il vient de faire d'une séries de systèmes d'armes contre lequel le Pentagone n'aura pas de défense avant des années. On ne voit pas comment la CIA pourra renoncer à la politique de coups d'Etat menée depuis des années de par le monde, dont l'aventure de l'Ukraine reste le modèle. Tout laisse penser que les services de renseignements américains menés par la CIA préparent toujours des opérations « covert » visant à déstabiliser Vladimir Poutine, avant ou après sa réélection. Il en sera de même au Moyen-Orient, où la CIA cherche encore par des opérations menées en directe ou sous traitées à des « rebelles modérés » islamistes de la pire espèce, à faire tomber Bashar al Assad et évincer la Russie de Syrie pour permettre à l'Amérique d'y retrouver toute son influence. 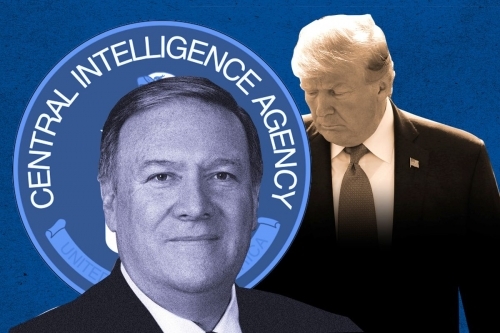 Par ailleurs la CIA et Pompeo personnellement ont toujours défendu le projet d'une guerre contre l'Iran. En ce qui concerne enfin l'Europe, où la CIA domine les institutions de Bruxelles et un certain nombre de gouvernements des Etats-membres, des pays comme l'Italie, l'Espagne, l'Allemagne et la France où des mouvements indépendantistes tentent de se faire entendre, n'auront qu'à rentrer dans le rang. La encore, la CIA saura y faire, directement ou par la voix d'anciens agents tels que Daniel Cohn Bendit. Si les oppositions politiques en France ou en Allemagne ne l'ont pas encore compris, elles le feront vite. Des coups tordus se préparent. Ceux qui ne veulent pas voir le danger prétendront qu'il s'agit d'allégations sans preuves. Libre à eux. Quand ils se réveilleront, ce sera trop tard. Quant à nous, nous devons nous demander jusqu'à quand les citoyens américains supporteront cette confiscation de la république par des équipes qui n'ont rien à envier aux SA et SS de l'Allemagne hitlérienne. Le WSWS a une réponse: d'ores et déjà ils sont tellement embrigadés qu'ils ne songent même plus à prendre le risque de protester.